July 31st, 2017 – Middelharnis, The Netherlands – OPNsense is the fastest growing open source firewall and security platform released under an Open Source Initiative approved license. 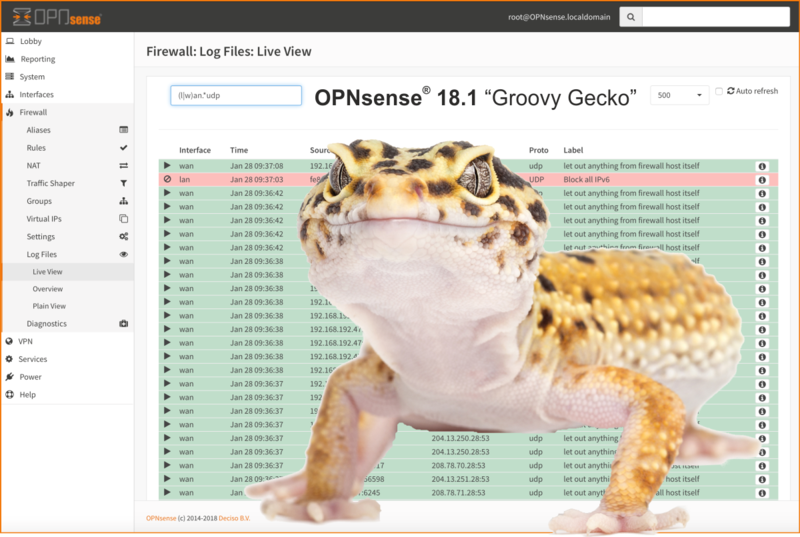 Deciso is proud to announce the immediate availability of version 18.1 named “Groovy Gecko”. This release with over 500 enhancements on virtually every part of the system is the result of our determination and a continuation of 3 years driving innovation, moving from legacy code to a modular design with multi-language support, reliable upgrades, inline intrusion prevention and HardenedBSD’s security. Since the previous major release, the – community supported – plugin infrastructure has grown and significant improvements to existing plugins have been made. New plugins include The Onion Router, Free Range Routing, and Group / User Access Lists for the built-in web proxy. Among the improved plugins are Free Radius, the high-performance TCP/HTTP load balancer, Tinc VPN, Clamav Anti-Virus and Let’s Encrypt for free and automated certificates. The community has – yet again – shown a significant increase, further aiding to our goal of becoming the most widely used open source security platform available. Users will notice the interface improvements such as submenu’s instead of tabs and the quick search on top now supports navigating to firewall interface rules. Firewall rule debugging has become a lot easier with the introduction of Live View (under firewall logging) with the ability to use regular expressions to filter firewall log rules. For developers, the RESTful API and the pluggable infrastructure has been further improved and extended, with features like routing and network address translation. Enthusiasts and developers alike are now able to try out development versions by simple selecting the release type from the firmware settings page. The latest release runs on the FreeBSD 11.1 and is extended with HardenedBSD’s security enhancements. OPNsense® is the only actively developed security platform offered under a 2-clause BSD license allowing customers to build their own products around our extensive ecosystem. The team believes that open source allows for sharing of ideas and helps to creating better products.